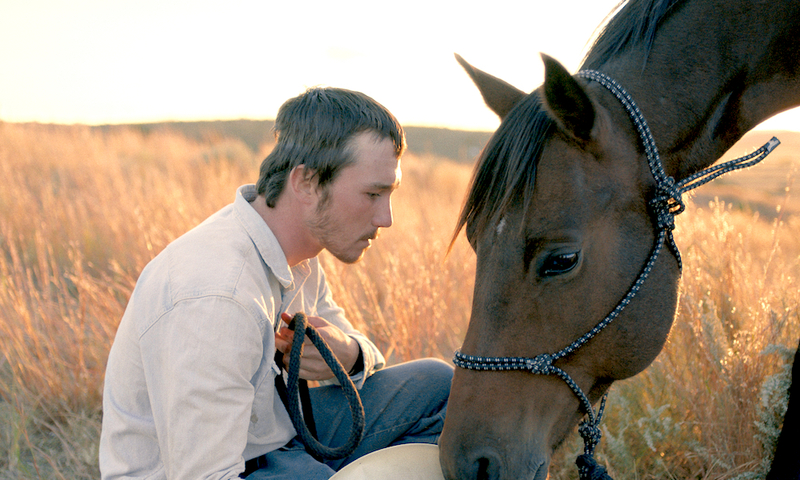 A poetic expression of hopelessness in a land of limited opportunities, Chloé Zhao’s The Rider follows a Bronco-rider from South Dakota as he traverses a fictionalised version of his ill-fated pursuit of a dream that’s galloping away from him. After suffering a near fatal head injury at a rodeo, and learning he might never ride again, young cowboy Brady Jandreau struggles to forge a new identity for himself; something which proves incredibly difficult in the equestrian heartland of America. He lives with his father (Tim Jandreau) and intellectually disabled sister (Lilly Jandreau), with Zhao recruiting them, and his real-life friends to help reenact Brady’s rehabilitation. The result is a searingly personal character study that uses non-professional actors in an attempt to understand the indescribable link between this horse riding community and the land they live and work on. A lot of has been written recently about the mindset of Middle America, with much of it reductive and defamatory. Here Zhao avoids politics as much as possible, instead rendering a mystical portrait of a region where community means everything and the corral holds an almost religious significance. An observational portrait of a secluded world that neither patronises its subjects, or romanticises their lives, The Rider is a mournful, yet transcendental film that merges the hard truths of documentary filmmaking with the poetic punctuation of fiction to create an alluring hybrid of the two. Sadly some of this magic is dissipated by an overly prescriptive narrative, with Zhao shining her spotlight a little too brightly on Brady’s internal conflict, which in turn blinds the audience to the broader social context that dictate the world he inhabits. Thankfully the fleeting glimpses of the wider landscape are beautifully captured by director of photography Joshua James Richards, who makes the most of the natural light of the South Dakota wilderness, shooting as often as possible during the golden hour to create a series of unshakable images. The result is a topography that feels as if its constantly on the brink of revealing its secrets, with the grainy textures of Richard’s images feeling like he’s captured the unidentifiable mysticism that lingers in the dust. Although Zhao’s film scores high on poetic imagery, she doesn’t skirt around the hard work and dedication Brady puts in to training horses. Some of the film’s best moments are those observing him as he breaks in foals, providing the audience with an insight into his methods while the camera’s inquisitive stare makes the trust that develops between man and horse the centrepiece of the film. This same degree of tenderness is also apparent in the scenes shared between Brady and Lane Scott; a friend and former mentor of Brady’s who ended up quadriplegic after a fall whilst bull riding. Now only able to communicate via hand signals, the pair sit silently as they revisit Lane’s former glory via YouTube clips and home videos. It’s a devastatingly tender scene, framing both men’s impossible dream of getting back in the saddle with the harsh reality that they’ll never ride again. While many filmmakers attempt to give a voice to the marginal and ignored, few do so with the same artistic and sensitivity displayed here, with Brady’s reenactment of his own experiences providing an utterly convincing record of a young man re-discovering himself in a landscape that refuses to let him go. A deeply felt personal journey, the film shifts seamlessly from unflinching realism to a poetic expression of masculinity in crisis; crossing back-and-forth across the blurred boundary that separates art and reportage to create a totally unforgettable film about the bond between people and place.